The Disney, Marvel, Hot Toys train keeps coming and pulling up to the station is Vision. 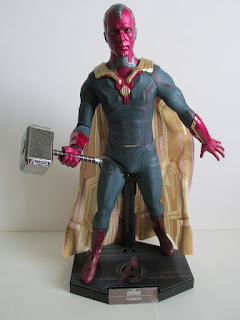 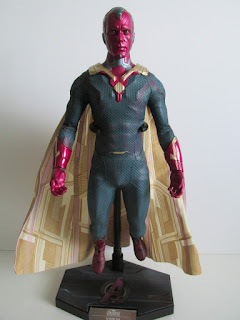 Vision is based on the likeness of Paul Bettany from the film, Avengers: Age of Ultron, and where this figure lacks in accessories he makes up for in other areas. 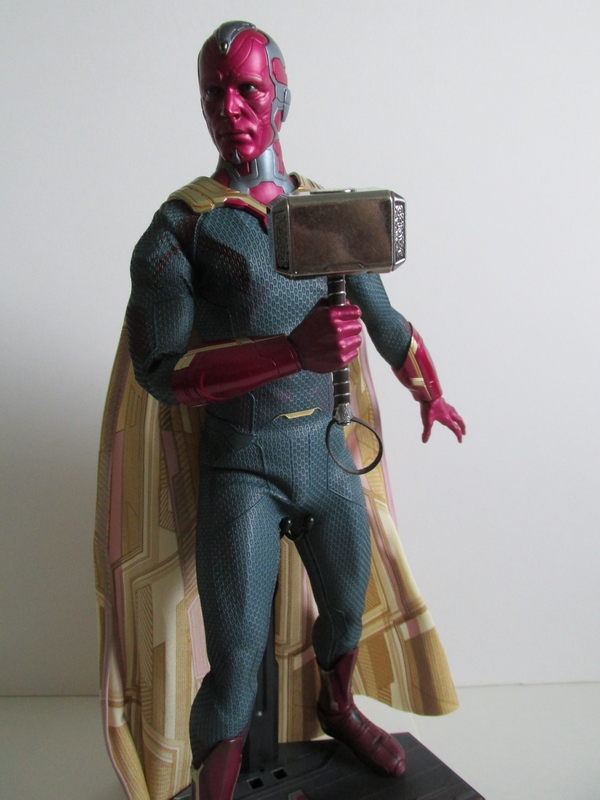 His head sculpt and paint job look great, and I love the detail put into his digital like eyes. 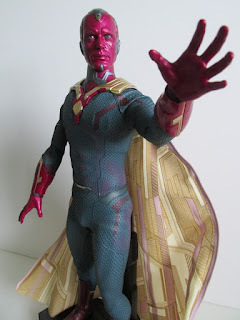 In the film, his eyes look like a camera lens but also have that uncanny human quality that I’m happy made it into this figure. 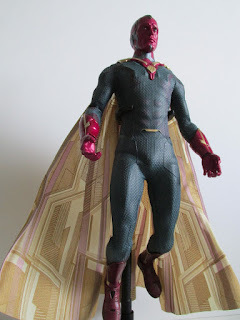 In terms of construction and overall feel, he reminds me a lot of Hot Toys Man of Steel Superman figure, which has a similar texture to Superman’s suit. 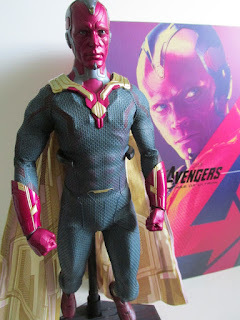 However, Hot Toys has improved that suit and brought it to Vision. 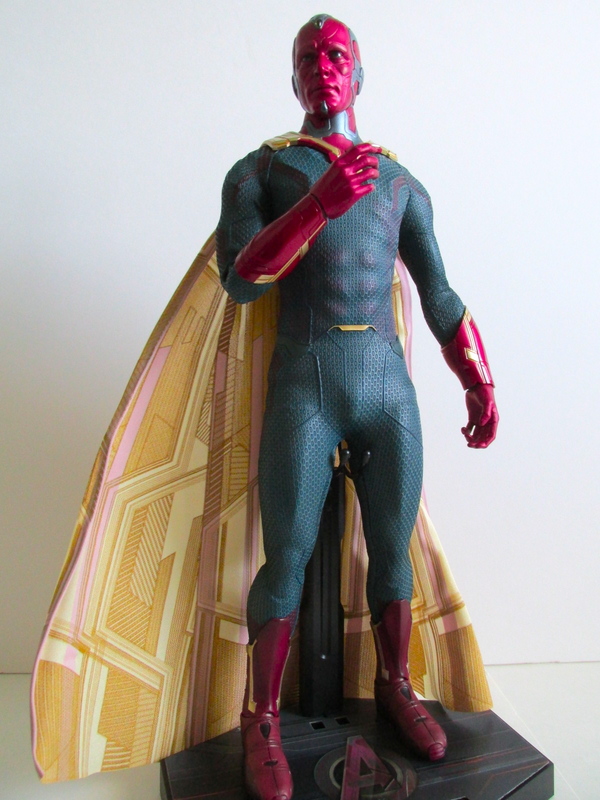 His suit is a little more flexible than what you would think and allows better movement between joints. The suit at the wrist has been wrapped at the peg so now it’s much easier to fit the hands on without the suit getting in the way. 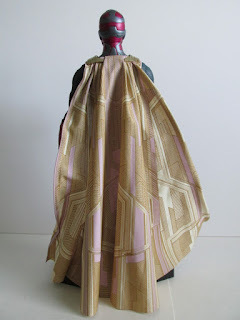 His cape was also wonderfully done considering the cape was a pure digital creation on film. Wire is put in on the edge of the cape to help with posing and is another welcome addition. 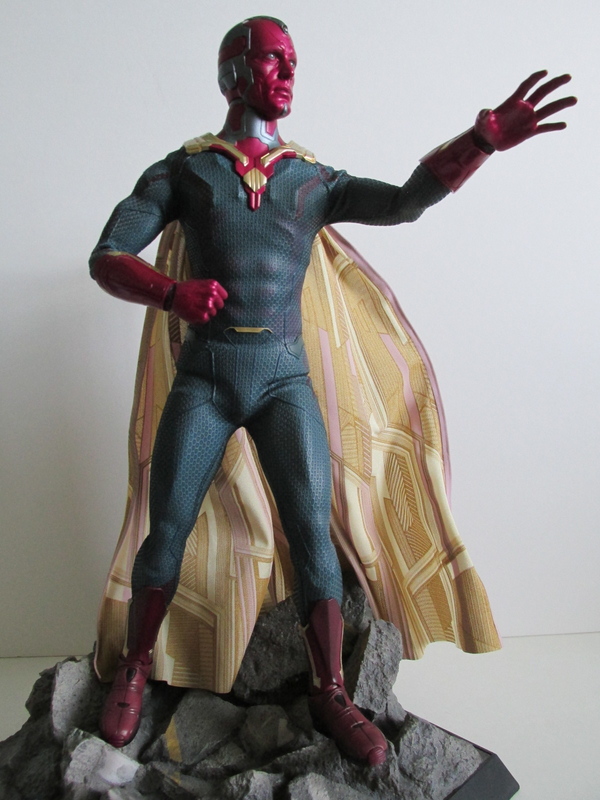 I like the option of having a normal stand and a dynamic rod that isn’t too tall. It seems to me this dynamic rod is much shorter than in other releases, and I’m thinking Hot Toys realized most of these figures would end up on a shelf or a detolf, which may not be able to handle a tall dynamic rod. 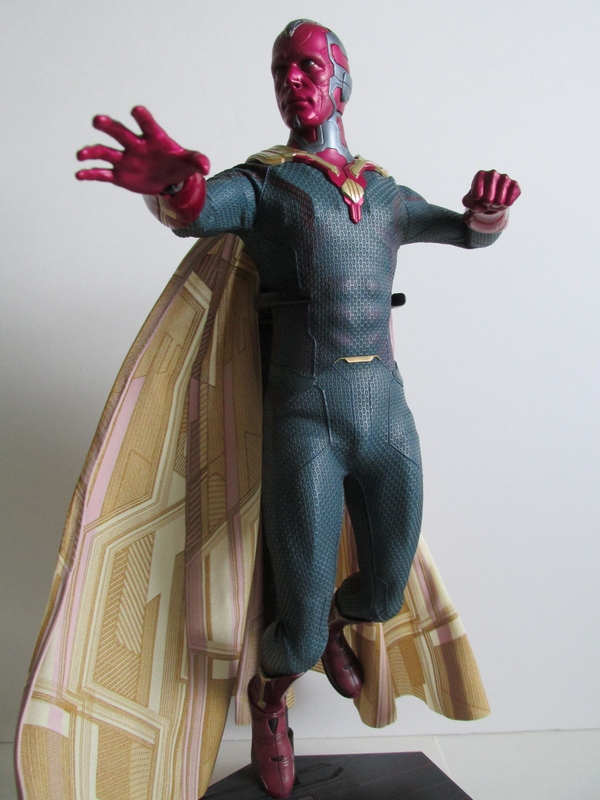 In this case, instead of pulling off a flying pose, Vision is now in a floating pose, and I like this choice from Hot Toys. 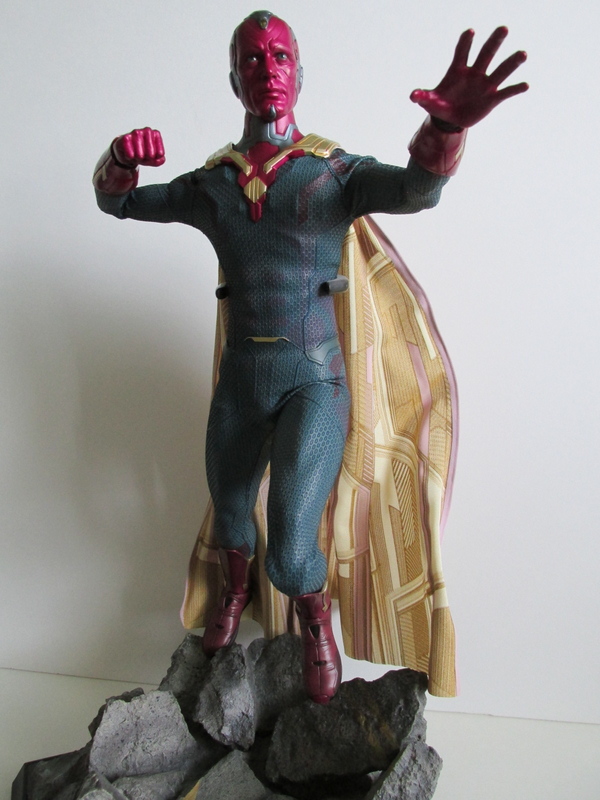 You can still put Vision in flying poses, but I’m sticking with him in floating poses. 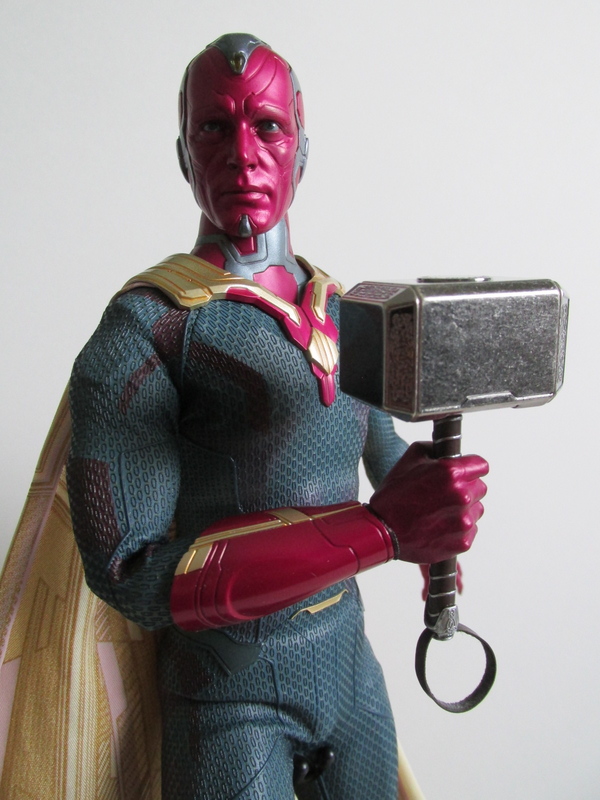 It seems to be a trend these days, but Hot Toys is not including many accessories for all their releases. Granted, Vision didn’t handle many props in the film and only showed up in the third act, but for the price you are paying, it would be nice if he came with Ultron sentry parts like Iron Man did or even a light up infinity stone in his head. 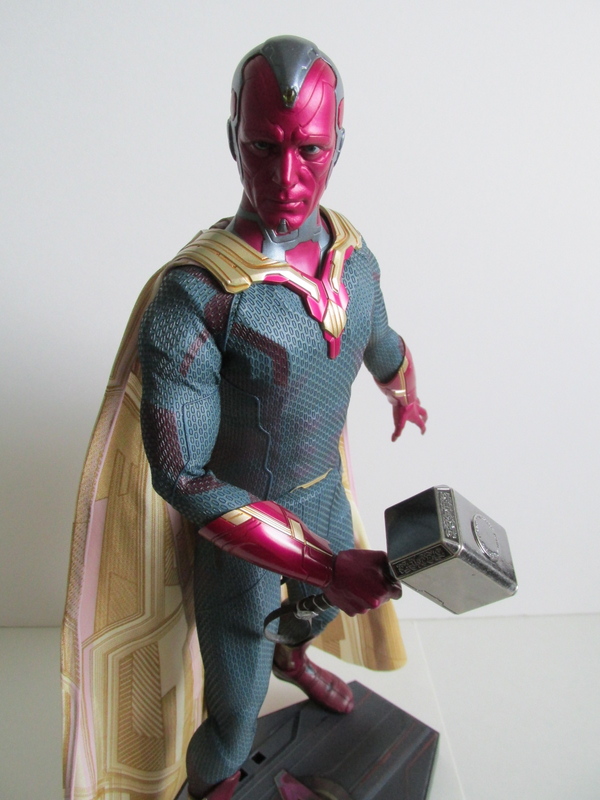 Overall, I’m happy to add Vision to my ever-growing Avengers collection from Hot Toys. He is a key character in the films and comics and because of that this was a common sense addition to the collection. Thankfully, he doesn’t look too different in the upcoming Civil War film…but we’ll see if I have to buy another Vision.